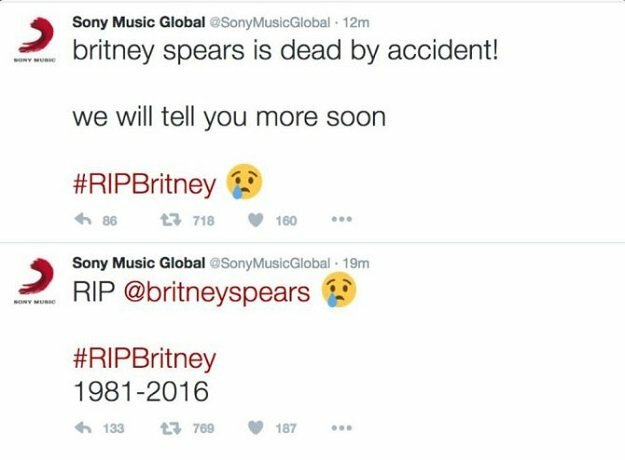 NEW YORK, USA: Sony Music Entertainment’s Twitter account was hacked on Monday, publishing fake statements that pop music icon Britney Spears had died. A Sony spokesperson refused to comment further while their Twitter representative did not return emails seeking comment. The fake tweets have since been removed. In some tweets, the group OurMine took responsibility, Billboard reported. Another unit of Sony, Sony Pictures Entertainment, was the victim of a devastating cyber attack in November 2014, which the Federal Bureau of Investigation concluded was the work of North Korea. That hack came a month before Sony Pictures was due to release the film “The Interview,” about two journalists recruited by the CIA to assassinate North Korean leader Kim Jong Un.